Cleveland shortstop Francisco Lindor is well-known for providing a sure glove and great range when he takes the field. This year he added a Home Run record to his legacy, as Lindor now holds the record for most home runs by a shortstop in Cleveland franchise history. 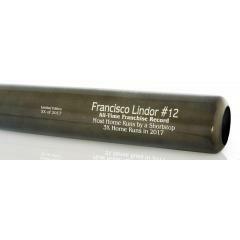 This beautiful, full sized, Francisco Lindor player model, black Maple Marucci bat celebrates this achievement. It will come engraved with his final home run total for the 2017 record-breaking season. This bat is the same professional model bat Francisco Lindor uses in his games: the Lindy12. Get your limited edition commemorative game model bat today before they are gone. Due to the limited release of this bat we must charge your credit card for the full price immediately upon taking your order. This policy ensures we reserve a bat for you. We will confirm your order by email. This bat is not game used. Please allow 4 to 6 weeks for delivery.